Tempura delicata squash and iced sake. Photography by Angel Tucker. James Mark is an antsy guy. The minute he’s done with one project, he’s got another in his sights: north graduated to a larger space in the Dean Hotel and he’s recently remodeled the original Luongo Square location, christening it — unexpectedly — Big King. The restaurant is one of the smallest in the state, serving just twenty people at two small tables and a counter. While north may be a creature of many cultures, Big King is all the way Asian, an identity that begins with the Zen aesthetics. If the din of conversation were turned down completely, you’d expect to hear trickling water and chimes. In fact, one of Mark’s greatest achievements to date may be that two dozen people can fit into a walk-in closet and still feel wholly serene. The walls are dark and the lights so low that most ordinary activity goes entirely unnoticed. Until the food arrives, all of Big King’s personality is channeled entirely through its pottery. Each piece is a muted palette of brown and blue, earthy but intricately crafted. Some are from local artists at the Steel Yard, most hail from Japan and, occasionally, Mark himself will spin a plate. The collection is a pretty good manifestation of what Big King is all about: varied perspectives on classic Japanese cuisine. Pickled vegetables are served at each seating, chopsticks are encouraged as utensils and the drink list centers on sake. If you’re still under the impression that it’s all one big vat of rice wine, Big King will prove you wrong twice. The menu reads like Jim Murray’s Whisky Bible, with entries that walk the line between aficionado and obsessed. The Nanbu Bijin “doesn’t bowl you over, it holds your hand” while the Asahiyama Junmai is “light and refreshing with plenty of acidity, but enough backbone and complexity to savor — but really only if you want to.” If reading isn’t your thing, servers will also spill out praise in poetic form as they speak about strawberry yeast and the manner in which this particular sake from Saga has changed their life. Left: Grilled chicken meatballs with Tare and handwritten menu. Right: Tempura potatoes with egg and Japanese curry. Photography by Angel Tucker. In this small space, great attention is given to layering flavor and acknowledging the complex potential of basic ingredients. Dinner is served as a four- or six-course meal ($40/$55) though there are a half-dozen a la carte dishes as well. The menu is handwritten in a leather journal each night and looking back at the months of culinary development is a bit like watching a child grow up in photos. Night by night the change is imperceptible but, seasonally, the evolution is marked. Of course some things never change about James Mark’s aura. The crowd remains young, pairing ski caps with faded CBGB T-shirts. But the food at Big King trades the brashness of north for something far subtler. A meal might open with slivers of raw fluke served with cool Asian pear sauce, cubes of sea robin dotted with hot pepper or nuggets of mahi nigiri topped with jalapeno. It’s sublimely simple, a study in ice, heat and salt that plays out entirely on the tongue. Fish dominates the kitchen, which adapts daily to whatever swims in local waters, including a tropical triggerfish that had made its way north. Bright and meaty, it’s served as a chirashi — scattered fish with rice — so bright and acidic that it obliterates winter in a bite. One of the benefits of a restaurant this tiny is that every diner is ostensibly sitting in the kitchen — a proximity that comes in handy when someone at the bar has questions. “I’m unfamiliar with triggerfish,” says a woman who is quickly eye to eye with the whole fish whose skin has been pulled off like a mask. “It sounds like sandpaper when he yanks it off the body,” offers a bystander to several nodding heads. The other advantage to such an intimately sized space is that meals are served with gradient pacing. Raw fish shifts to vegetables which, in turn, give way to deeply charred dishes. The mid-courses are — like all of Mark’s vegetarian offerings — reliably entertaining. Big King loves a tempura batter and if someone doesn’t like fried food, they’ll learn to keep their secret from this crowd. 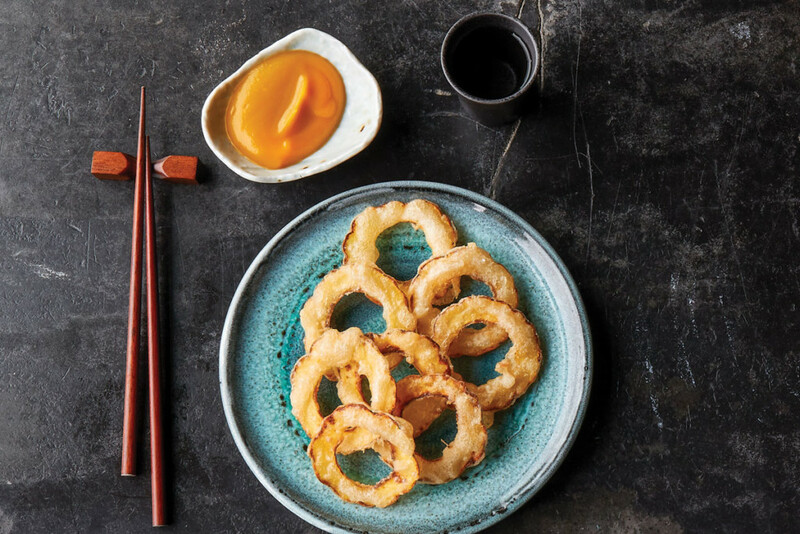 Rings of delicata squash, logs of long pumpkin, shishito peppers and thin shards of root vegetables are all battered, crispy and easy to love. But what makes them more than fun are the accompanying sauces: ginger-garlic, spicy walnut, poppy-kale. It’s a twisted french-fry bar that readily gives up everything American except for appetite itself. Left: Lobster with soy milk and poppy. 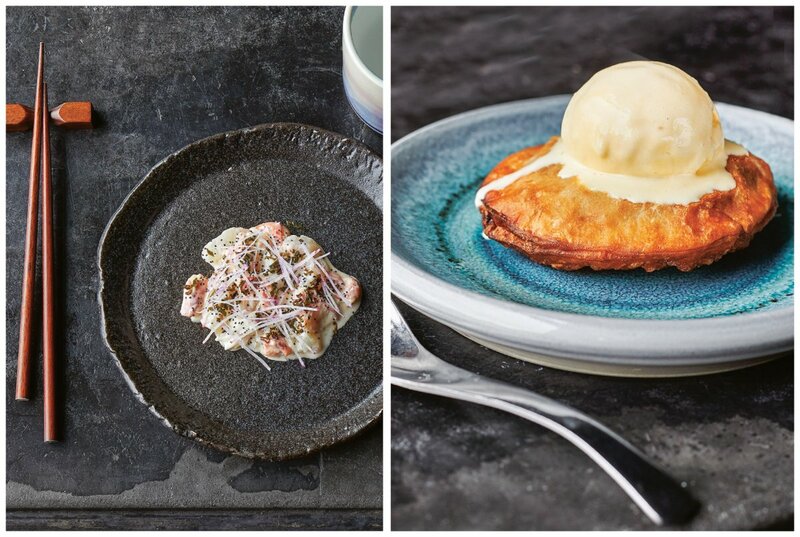 Right: Strawberry and pear pie with ginger ice cream. Photography by Angel Tucker. Eventually, however, the kitchen forgoes humor and reaches for intensity. Grilled bluefish and maitake mushrooms are so deeply seared that they arrive smelling like a campfire, smoldering on top of rice. Delicate pumpkin dashi is served on the side rather than over the top so that the contrasting flavors might coexist harmoniously rather than eclipse each other completely. Even a quartet of smoky chicken meatballs is served with a raw egg yolk to make the rich dunking sauce richer and to ward off any wimps. After strolling through shots of sake, all attention turns to the few, ever-changing desserts that are too endearing to overlook. An ice cream sandwich of brown butter cake and pumpkin ice cream is a dream for shortbread lovers, barely sweet but delirious with butterfat. Even better is what’s advertised as “Asian pear pie” but is really a disk of fried dough rolled in sugar, stuffed with fruit and topped with ginger ice cream. This may be the only course that Japan can’t take any credit for but it’s also the one that marries Asian heritage to Rhode Island ritual. 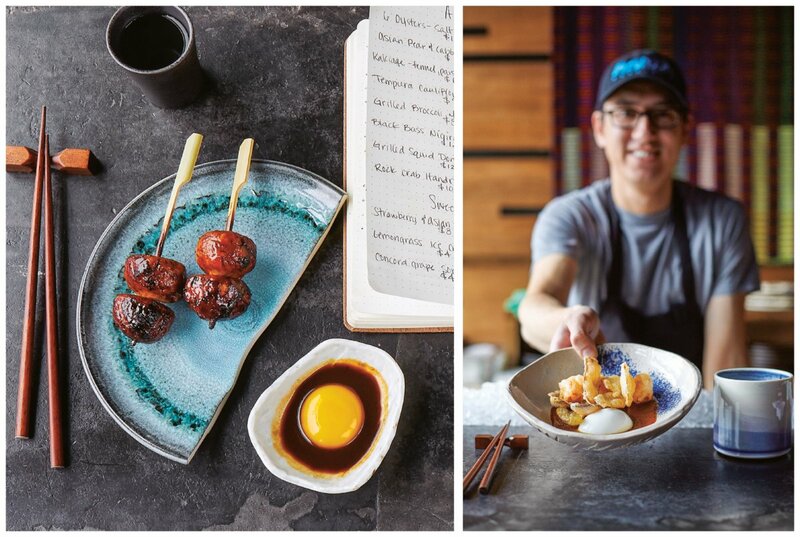 Cross-cultural space is clearly James Mark’s sweet spot and, as it turns out, he continues to create some of the city’s most vivid culinary journeys with the smallest possible footprint. Open Thurs.–Sun. for dinner. Wheelchair accessibility will be difficult at best. Street parking. Cuisine Jiro dreams of a small space. Capacity Twenty-one with counter seating. Vibe Laidback and comfortable but still exotic. 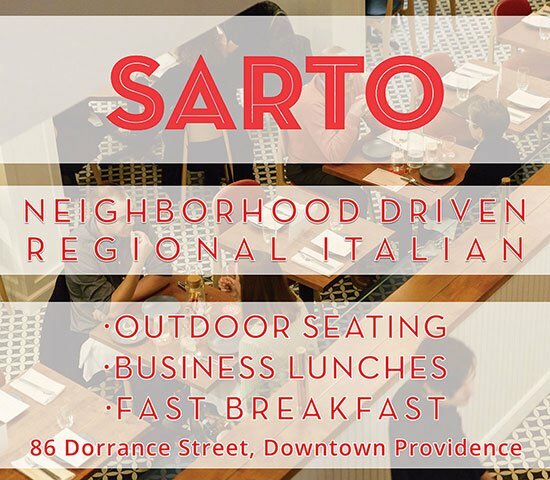 Prices A la carte $7–$15; four/six course meals $40/$55; dessert $4. Karen’s picks Fish and veggies.